Competitive prices plus the right softener specification for your home. If more than one softener option is suitable, we will be clear about what the pros and cons are of each choice. We’ll give you instant fixed price quotations by phone, reconfirmed in writing by mail or by email. Our trained and considerate installation teams cover all of UK. Simply phone 0344 567 9032 or click here to request your free 5 minute phone survey and quote. Our surveyors can put you in touch with an existing softener user if you wish. 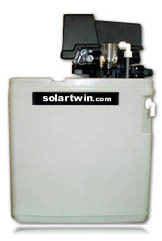 We only install ion-exchange (salt-based) water softeners, since these offer the best performance. Get a free phone quote today – We can nearly always quote you for a water softener over the phone! (so no intrusive salesperson visits!) – Click here to request a survey.